I’ve been having problems with my printer. Actually, it’s been annoying me for quite some time. The gremlin inside it gets particularly difficult when I’m trying to print something off before rushing out of the door to catch a train. Perhaps I should admit to be partly to blame for my problems. Having bought my inkjet printer for next to nothing, I discovered that the cartridges were very expensive. Anyone who has done any research into printers will already be aware that this is where the manufacturers – Epson in this case – make their money. So I started buying cheap replacement cartridges – and using those. This was a huge saving in the cost of individual cartridges and environmentally it seemed to make sense too. Cheaper cartridges are generally recycled branded cartridges. But I’m not sure it stacked up in terms of number of copies printed. And it certainly wasn’t great from a time and hassle perspective. The printer rejected non-Epson cartridges with horrible messages that flashed up when you put them in. Sometimes a bit of persistence paid off and it settled down but the print quality was extremely variable. It’s clear that there’s a raging battle going on between the printer manufacturers and cheap cartridge producers. To my mind it’s a bit of a scam – and there don’t seem to be any winners. It’s very frustrating for the user and expensive but I think it also leads to a lot more waste and a lot less recycling. Epson wouldn’t take back their cartridges for recycling – and their new ones don’t appear to be made from recycled materials. The cheap cartridge manufacturers seem to sell a large number of products that don’t work properly and therefore get discarded without being fully used. And there’s probably a lot of paper being wasted as people like me try and sort out the glitches in the system..
My printer has apparently finally given up the ghost. When I took it to the printer shop the first question they asked was how long I had owned the beastly machine. 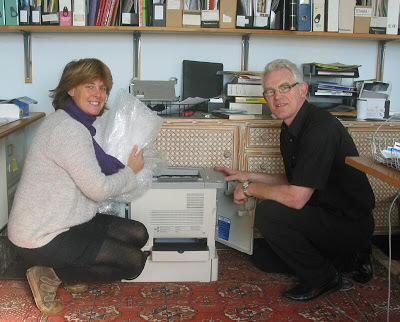 When I told them it was about 6 years they seemed pretty certain it wasn’t going to be worth repairing – they said that most printers were designednotto last for too long but that it might be possible to re-programme it. Not this time. The first major decision for a new printer was laser or ink jet. Lasers are more expensive but appear to be more durable and perhaps better value per page printed. But I was amazed to discover that a full rainbow cartridge was equivalent to or even more expensive than the printer itself! I’ve found a machine that has been refurbished and where the cartridges can be re-filled by the printer shop – £120 for a rainbow set. But one big advantage over the lasers is that you can replace each individual colour. With ink jets, just one colour running out means replacing the whole cartridge. Using recycled paper is also a priority for me – pretty well all the paper I use has something else on the other side. I’m hoping for less hassle this time round – and less waste. I haven’t yet done any work for a printer maker but I’ve lots of advice to offer if they want it! There’s clearly room for improvement…. Originally published on Telegraph Online.. This entry was posted in About me, BLOG, Done, E Waste / WEEE, News 2008, Technology & Design and tagged E-waste, Office, Printers, Recycling, Waste. I want a ‘Flinstones’ style printer where a bird ‘pecks’ onto a tablet of stone – considerably better for the environment and a lot longer lasting ! !